I have been away from my blog the past week or so, but I'm back today with a selection of fantastic gift ideas from Laurence King Publishing. I have enjoyed looking through all of these books, and I'm pretty sure this publisher has something for everyone on your gift list! 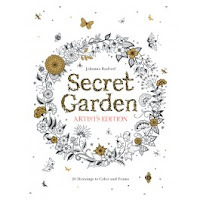 Summary: From the publisher that brought you the hugely successful Secret Garden and Enchanted Forest by Johanna Basford - this special artist's edition features 20 beautiful, pull-out art prints for coloring in. 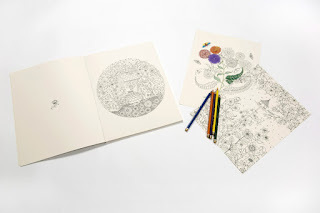 Colouring fans of all ages will enjoy immersing themselves in a selection of the most popular artworks from the original book, now presented in a new, large-scale format for maximum coloring enjoyment. A few weeks ago, I reviewed some gorgeous adult coloring books and, in the process, discovered why coloring is such a huge craze. 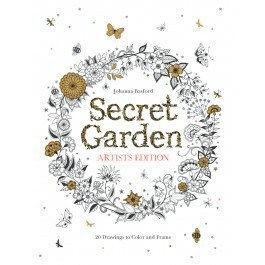 The latest coloring book to catch my eye is SECRET GARDEN ARTIST'S EDITION: 20 DRAWINGS TO COLOR AND FRAME by Johanna Basford. SECRET GARDEN ARTIST'S EDITION is absolutely beautiful. This new coloring book has twenty of Ms. Basford's most popular artworks from the original SECRET GARDEN book to color, and they are amazing. The book is a little larger than the "typical" adult coloring book (about 10x13 inches), and the pages are extremely thick cardstock quality. The pages are also designed for easy removal so you can frame your latest coloring creation. As you can see from this picture above, these coloring pages are spectacular. SECRET GARDEN ARTIST'S EDITION would make a great gift! Summary: Can’t decide what to wear in the morning? Why not mix a punk hairdo with a period dress? 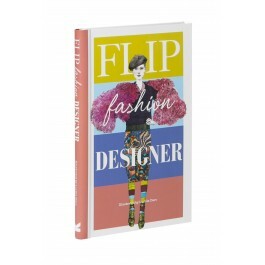 The pages of this interactive book (split into four parts) will take you from fashion faux-pas to fabulous in one flip. FLIP FASHION DESIGNER illustrated by Lucille Clerc is a terrific gift idea for the fashionista in your life. This book is so much fun and gorgeous too! FLIP FASHION DESIGNER is an interactive book (geared towards adults which is so cool) that allows you to mix and match styles to create a look entirely your own. 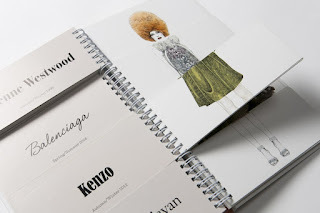 Each page of FLIP FASHION DESIGNER is made up of four sections -- head, chest, legs, and shoes. You can flip back and forth between the various designers to come up with a special outfit. As you select different options on the right of each page, you can see the designer and the year on the left. So I guess you could say this book is fun and educational! You can make over 100,000 different styles with the wide variety of choices in this book so it will never get old. Highly recommended to anyone interested in the history of fashion! 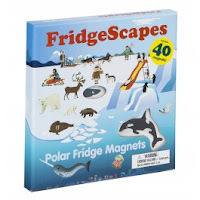 And last but certainly not least is the fun gift idea FRIDGESCAPES: POLAR FRIDGE MAGNETS illustraed by Caroline Selmes. 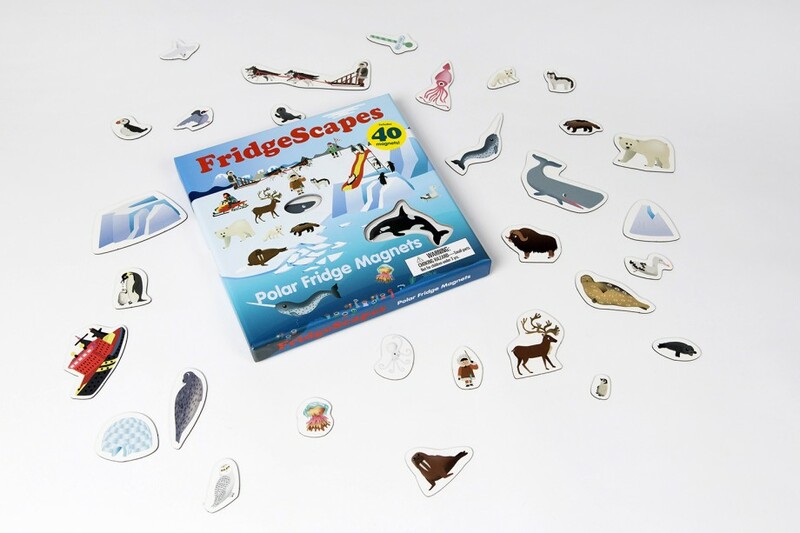 This boxed set includes 40 magnets so you can create your own polar scene. This gift set is especially cute, and as a mom, I love that the magnets can be securely kept in a box! I loved the variety of animals including polar bears, penguins, seals, and more. The magnets are a few inches in size so they are not recommended for kids under the age of three. I think this set of magnets is a fun gift idea. Kids (and even adults!) can use their imagination and create unique polar landscapes. To complement the FRIDGESCAPES POLAR FRIDGE MAGNETS, you should definitely check out STICKYSCAPES POLAR ADVENTURES. 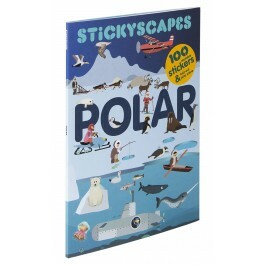 This sticker book has more than 100 stickers so kids can create polar landscapes on a fold-out play scene. My kids had sticker books similar to this one when they were little and they absolutely loved them! Thanks to the publisher for providing review copies of these items. I will be back on Saturday with a few special Laurence King kids' books! I've never heard of that publisher but they sure do have some unique books that look like loads of fun!